After his very public break-up from his fiancé, Chad Fletcher is convinced that a healthy marriage and his rising political career won’t mix. 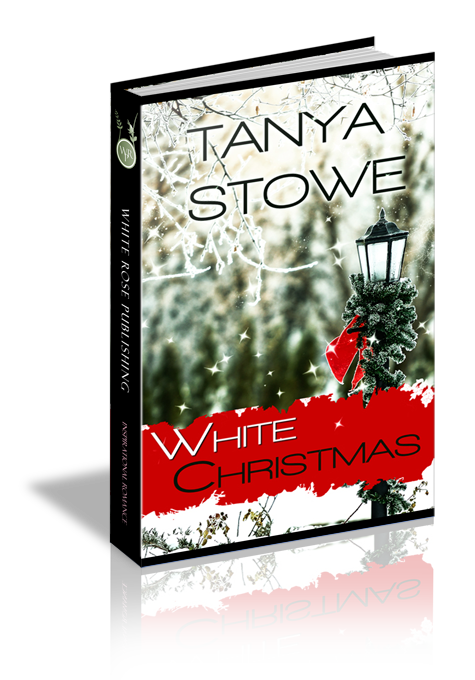 Christmas at his Aunt Nell’s home in White, Arizona is a great way to start fresh. Political watch dogTessa Conway plans to spend her Christmas vacation enjoying her grandparents’ ranch before they must sell it. So she is not pleased with Grandma Sophie and Aunt Nell’s efforts to throw her and Chad together during White’s Christmas celebrations. Chad begins to believe Tessa may be the perfect antidote to his unhealthy relationships of the past. But when he decides to take support from a company with questionable ethics, his perfect bubble is burst. Fearing Chad is not the Godly man she believed him to be, Tessa ends their budding romance. Will Chad find the strength and courage to do what’s right even if it costs him his career? “I don’t know why you insist on wearing those ridiculous things. How can you see?” Aunt Nell asked, rubbing her hands against the cold evening air. “Real life,” she said. “As if we don’t live real lives here in White.” She made the sound again and Chad smiled. The small rural Arizona community was as far removed from the high profile life he lived in Phoenix as it could be. Even as a child, visiting his mother’s aunt had been his favorite way to spend the summer. Time with Aunt Nell and working as a teenager for the local ranchers had taught him more about life than all of his family’s country club years in Tucson. His aunt knew how he felt, so when he took her arm and squeezed, she smiled and patted it back. “Which wasn’t such a long time ago,” Chad said. “Hush! It’s a wonder they let you talk at all on the chamber floor. You’re so full of nonsense.” This time she slapped playfully at his hand and he grabbed it. Chad studied his aunt’s face and realized she was searching the crowd for something…or someone. “I’ve had enough romance to last a lifetime,” he said, his tone tight. He winced, thinking of the things he and Carly had endured before she called off what the media had dubbed “the match of the decade.” Carly was the daughter of a prominent Phoenix businessman and they had become social fodder for newspapers across the country. The pressure had been incredible and Carly simply hadn’t been up to the challenge. He wasn’t sure any woman would be. “Broken?” she said and one eyebrow rose in a quirk. “Deal,” she said with a heavy sigh. Chad jogged down the blocked-off street, moving around folks crossing back and forth. He couldn’t help but smile as he heard friends calling to each other and joking. The comfortable, friendly attitude was just what he needed. He congratulated himself on his decision to spend the holidays with his aunt. She called it hiding out, and she was probably right. He needed time to regroup. He couldn’t think of a better place to do that than right here where the pace was slower, and the important things like family and friends were everyone’s priority. He was even looking forward to the peaceful services in Nell’s little church. In spite of what she thought, he did need some healing after his very public, very painful break-up. As he left the crowd behind and ran into the quieter, cooler part of the street, he shivered. He’d forgotten about the cold. During the summer months, the cooler temperatures of the White Mountains were a welcome break from the blistering heat of Phoenix. In the winter, however, those same higher elevations could lead to snow. As he thought about it, not such a bad image. White, Arizona covered in snow. It felt good to stretch his legs out. He’d missed his daily run and the short trip back to the car actually helped work out some of the kinks. He found Nell’s red gloves on the front seat and jogged back in less than five minutes. Nell had not yet returned to Pioneer Square so he waited, watching the people gathered around the tree. One young woman was surrounded by four or five children. Something about her struck Chad as familiar. She had long, strawberry blonde hair and it curled, uncontrolled beneath her purple knit cap. Naturally curly. He smiled, seeing the way it tried to frizz around her face in the cold damp air. It gave her an uninhibited quality he liked. She turned at that moment and caught him staring. Though she was a red-head, he could only see a sprinkling of freckles across her heart-shaped face. Even from a distance of ten feet, a pair of the brightest blue eyes he’d ever seen sparkled back at him. He returned the smile before lowering his gaze. Now that was exactly the kind of small-town girl Aunt Nell wanted him to meet. Glancing back at her laughing face and bright eyes, the idea didn’t seem half bad. She chose that moment to glance his way again and they caught each other’s gaze. Another half-smile and Chad turned away, feeling his momentary pleasure slip away. The last thing he needed was to give this young woman any ideas. Besides, the two- or three-year-old standing next to her had the same curly, strawberry-blonde hair. Probably her daughter. He looked around, hoping to see his aunt, but she was nowhere in sight. His gaze drifted back to the young woman and once again, she looked at him, this time with a slight frown between her eyebrows. Great. She’d recognized him. Sooner or later, she’d work her way to his side and casually introduce herself. He looked around again. Where was Nell? With his back to them, he heard the children around the woman say, “Santa.” One little girl squealed and clapped her hands. Fortunately for Chad, he turned just at that moment, because the little girl spun and charged right into him. She bounced off his legs and landed flat on her bottom. Sitting splayed out with her hands behind her, she stared up at him with blue eyes wide. Her hair curled rebelliously around her navy-blue knit cap. She looked so adorable, Chad bent to pick her up before he remembered her mother had recognized him. “Emma!” The other children came running up. “Say you’re sorry,” said the oldest girl, who looked to be about ten. “Sorry,” mumbled little Emma, who ducked her head and looked up at him through the longest, darkest eyelashes he’d ever seen on a blonde, let alone a red-head. Did her mother have the same eyelashes? He looked up in time to see the woman joining them. “OK.” The girl started towards the road. Chad couldn’t help noticing that her eyelashes were as long as Emma’s. Even with the dark mascara covering them, they looked luxurious. He was so amazed by them, he spoke without thinking. “Your watch?” he asked. “She looks so much like you I thought she was yours.” Again he spoke without thinking, something he’d learned as a politician never to do. There was nothing pasty about the peaches and cream complexion he saw in front of him. In fact, it was so creamy that it tempted him to run his fingers along it just to see if it was real. But he didn’t and he didn’t say anything out loud. He was beginning to get his wayward thoughts under control and he certainly wasn’t going to give her anymore openings for conversation. He just nodded and looked up at the trees. He groaned inwardly. Here it comes. The questions. The comments good and bad…usually bad…about the job he was or wasn’t doing as an assemblyman. Or the fawning attention, the one he found the most annoying, because his face had been in the gossip columns so much. The sound of her soft laughter caught him off guard. He glanced up and she leaned forward. He studied her face, wondering how he could have missed her even in a crowd. “I thought you looked familiar, but I don’t remember….” He faltered, realizing how unflattering he sounded. She winced, wrinkling her pert little nose. She turned back to the Christmas tree as if the subject was closed. Chad leaned forward, studying her face until she turned back to him. She turned and frowned, the same thoughtful frown he’d seen a few moments ago. It wrinkled her forehead and made her seem very serious. He started to chuckle and she looked away, catching her lower lip with her teeth.